Is your home cooling system not as effective as it used to be? Don’t sweat it ­­ figuratively and literally. Problems with air conditioning, exhaust fans, and other cooling systems happen to the best of us. The good news is, they’re easily avoidable with a Berwic cooling maintenance plan. Let’s face it, you can’t spend the whole summer at a beach or any other place where you can beat the heat. You still have to spend a good chunk of the season at home, most likely with the AC on full blast. During these months of heavy use, the components of your home cooling product are more susceptible to wear and tear. It may not lead to the total failure of the entire cooling system, but it can definitely impact its performance and power consumption. Want to take the next step to a more reliable home cooling system? 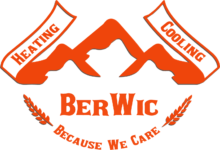 Our lines here at Berwic are open 24/7. Just dial (587) 275-­4822 and we’ll gladly answer any of your questions.